Interlibrary Loan is a privilege extended to the PSU borrowing community. It is designed to open up access to material that is not owned locally, and by nature, we do not ask to borrow material from outside sources if it is owned in the community. In these cases you should place a hold for the material at the Circulation desk. This includes material that is currently checked out. Faculty and graduate students have semester checkout, however the due date is shortened if a hold has been placed. Please see a representative at the Circulation desk for more information. Unfortunately, we cannot tell you ahead of time when your material will be available. Items arrive at different times from different libraries, and in many cases more than one library must be tried before the request is filled. Libraries are chosen, and your request is sent out typically within one business day. It could take a bit longer during peak times of the semester. Once your request has been sent, it usually takes one or two days for photocopied articles to start arriving. Many are delivered online, and they are forwarded directly into your ILLiad account. Books take at least one week before they start to come in. These arrive in the mail or other delivery system. The majority of our material is obtained at no cost to you. We have a subsidized charge of $10.00 for items obtained from libraries that charge us for their service, and you have the option to approve those charges in advance. If your request states "Free Only", we'll only try free libraries, and return the request to you for approval if we are limited to libraries that charge for their Interlibrary Loan services. How long can I have it? That is strictly up to the owning library. The average loan period is three weeks, and some libraries will renew one time. Renewals may be requested from within your account starting five days before your due date. You may want to find another source if you need a book for a semester long project. ILLiad sends out an e-mail reminder on or before your due date, then two overdue notices. Your ILLiad account is automatically blocked on the third notice, and you are unable to request new items until the block is released. The first and second days after the due date are $.50 each. The third and following days are $1.00 per day.We do charge fines even when the Library is closed, and on holidays. Please return borrowed items directly to the Interlibrary Loan desk. If the Library is closed, you may place them in the outside book return. How do I know when it's here? When items arrive, ILLiad automatically sends an e-mail to the contact address you list in your account. Check your spam filters, we can't get around those. Many people set up an ILLiad subdirectory, and have the e-mails filtered into that, so new messages are easy to spot. E-mails come from "ill@library.pittstate.edu", "ill_borrowing@library.pittstate.edu", and "rsamford@pittstate.edu". You may also read copies of your e-mail notifications. They are duplicated in your ILLiad account. Take the sidebar link after logging in. Pick up what you request, or contact us if you no longer need it. Don't highlight, underline, or turn down pages. You may be charged for a replacement, as designated by the owning library. Bring materials back, or request renewals if they are allowed, on or before the due date. There is a paper band on the front of each item, please leave it there, as it identifies the material as an Interlibrary Loan, and not Axe material. We want to be able to properly credit you for the return of all material. Be specific in what you request. The Reference department is great at helping narrow down your sources. 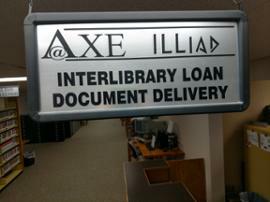 Material borrowed on Interlibrary Loan is not the property of the Axe Library or PSU and is not subject to any guidelines or conditions we establish on our own material. Each lending library sets the conditions concerning the loan of its property. You must abide by those conditions, but options may be available. Books may be requested from a second library if necessary, and if requested early enough, a second copy might arrive before the first loan must be returned. Lenders have the right to recall their material at any time if requested by their own patrons. What is not available on ILL? Textbooks: Textbooks and other material currently sold for courses offered by PSU or other institutions are not obtained on Interlibrary Loan. Those campus bookstores can supply the material needed. Material owned locally: Books owned by Axe or other Pittsburg libraries should be requested through the Axe Circulation desk. Items that are checked out will be recalled for you. Material at the Pittsburg Public Library may be checked out directly. PSU students are not charged a fee to obtain a Public Library checkout card. Old, rare, reference, and brand new: We can try, but many libraries will not loan these items. Copies of specific pages may be obtained if the condition of the material allows. Audio CDs:You may have two active audio requests at one time. DVDs:You may have one active video request at one time. Exceptions to these restrictions can be made by conferring with interlibrary loan and demonstrating a research or other academic need. Why was my request canceled? Requests are canceled for a number of reasons. Many are requested, but unavailable, some are only held at libraries that do not loan, others are canceled because of Copyright issues. When requests are canceled, the status is shown in your account, and an e-mail is automatically sent stating the reason. If there is a condition that you can correct, you may do so, then re-submit the item, using the original record in your ILLiad account.